the hint of the garden coming alive. Maybe flowers on trees, but for us, the first sign of spring is not flowers, it's skunks. The skunks are on the move. While I may not see them, I know they are around. Their heavy scent wafting on the air as well as the most fragrant Daphne and much, much further. The foxes have been regular night time visitors and the raccoon rolls through every few days although there is little left out to munch on. I leave the feeder out when it has gotten down to the seeds that should be cleared out anyway before refilling. The garbage can gets pirated once in a while even with the bungle on it. Those little hands seek the tops of the bags and pull and pull. Such clever animals. Deer have been spotted near the property and for me they are biggest pests. Yep, spring is much more than daffodils and tulips, both of which are just starting to either bloom or leaf out. The sewing salon has been a busy place. I made a pair of boxer shorts for summer PJ's. I'm not sure I'm wild about them. I used the First Choice boxer pattern I use for Gene's skivvies and I can't say I'm a fan of the 5 panel design. 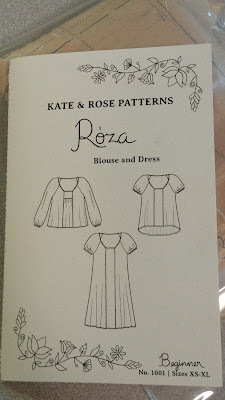 I think in the end, I will use the Phoebe pant pattern in cotton knit and just do them bloomer length. 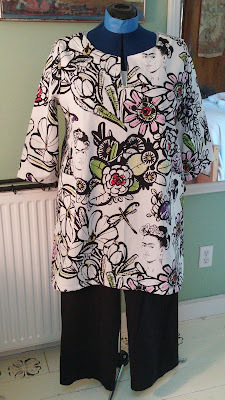 I pulled some cotton lawn from stash for another Kiota top. 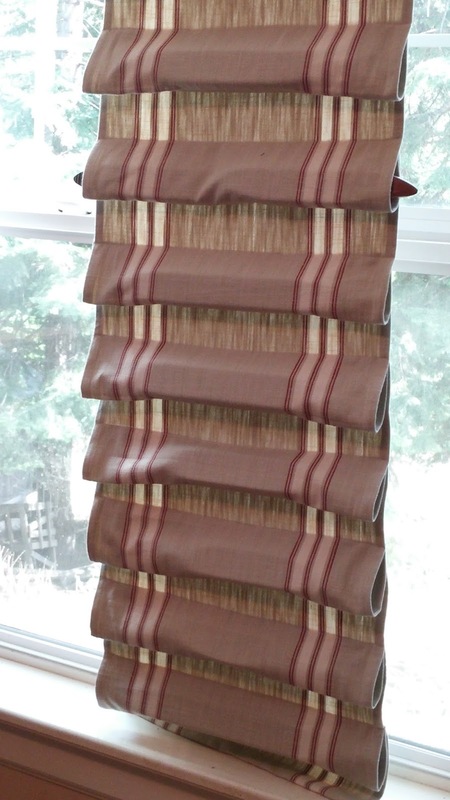 This fabric has a sateen feel to it but much lighter in weight. And I am feeling the orange/coral vibe with colors this year. 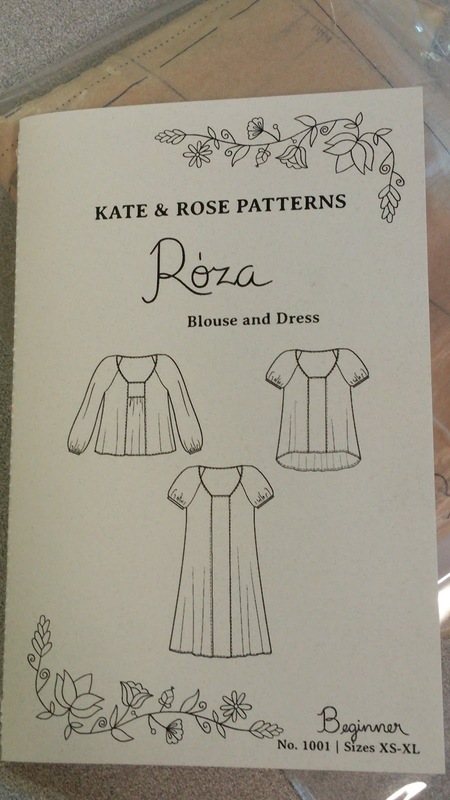 A wearable muslin was done for the Roza pattern by Kate and Rose. 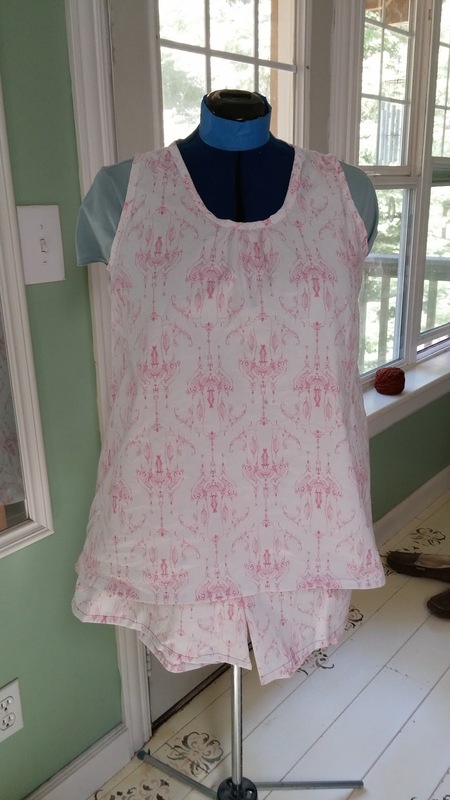 This was a bare bones version and I like it so much I wish I had added pockets. 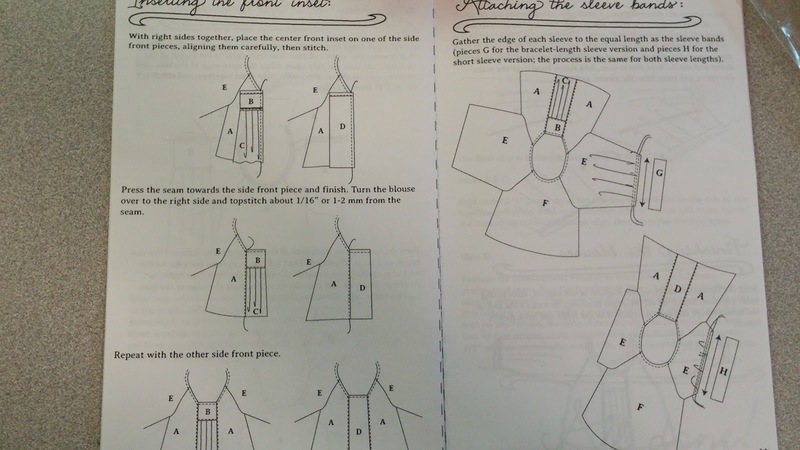 There is second in the works and pockets have been cut out for it. As a child during the 60's and a teen in the 70's this top has that hippie vibe I so knew and loved. I think they refer to it as "bohemian" now. In any event, I like the pattern and can see it becoming a TNT pattern easily. I also like that it is all done in the flat. The last make turned out far better than I had anticipated. I fell in love with this big Frieda print. It was the floral portion that attracted me but I thought it would be hard to use. The Esme tunic was the perfect choice for this print. Could be a season favorite. 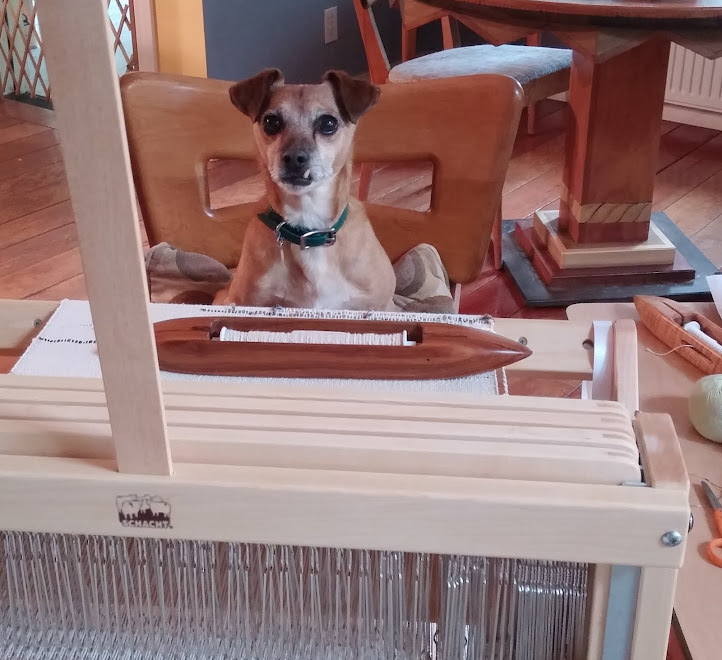 In the weaving studio, the weather was nice enough one day to wheel little pup Fiona outside. So flipping easy to do. 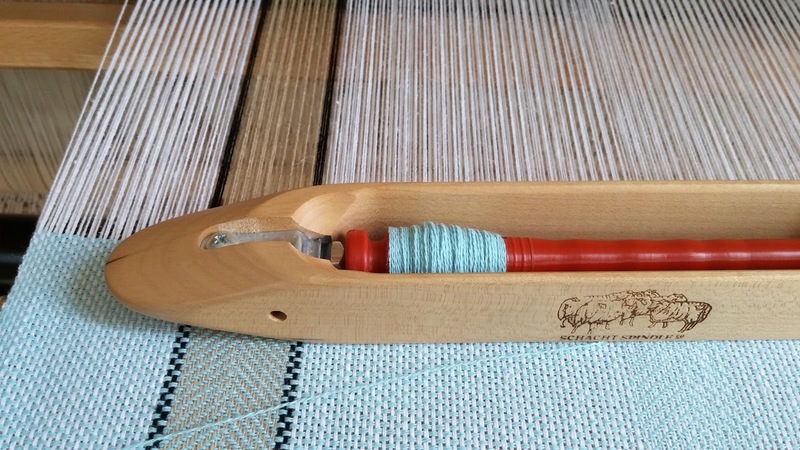 I lam smitten with this little loom. I have since finished her warp. It's been washed and dried and just waiting for me to cut apart and hem. The Spring has seen some action also. I liked this light turquoise and decided to do a whole towel in it. I have a darker shade to try too. And "helpers" abound. Ah yes, the weaving mutts of Camp Runamuck. With 5 looms one needs a fair number of shuttles and storage is always challenging. So just what do you do with 4 yards of commercial toweling? This. Holds 11 of them but needs a sturdier dowel before I can call it done and hang it. Farrier today, shopping with Mom tomorrow, Grower's market and food shopping Thursday. Another busy week in the making. Oh, I totally agree with you on the skunks! They are the first to make themselves known in spring. But they often do a late fall scenting round too. Phew! And your shuttle holder...you just gave me a great idea for some yardage I have hanging around. Now it may just truly hang! 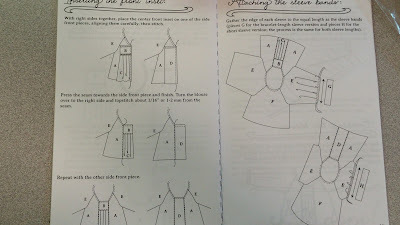 Love the new sewing - especially those sleeveless tops. Shuttle holder is great. I made one to fulfill a guild challenge many moons ago but it only held 3 shuttles. It was an exchange. When the elderly weaver that got it stopped weaving she gave it back to me so it hangs in the studio. 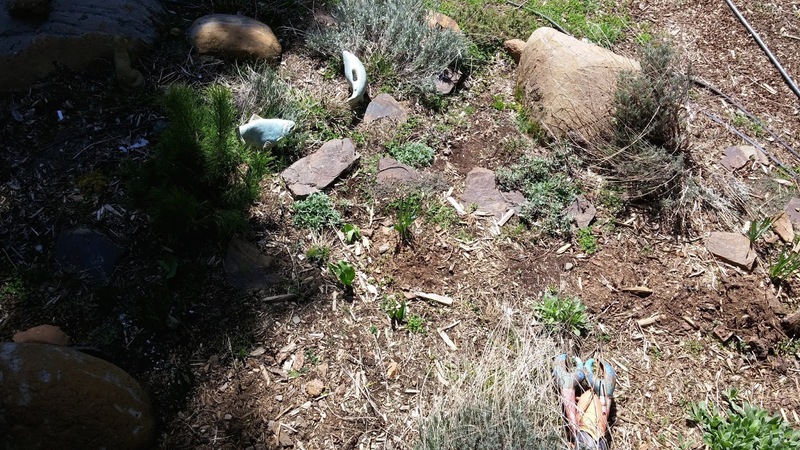 Send the excavation crew over, I need several holes that need digging in the yard so I can plant some new pine trees for a wind break. 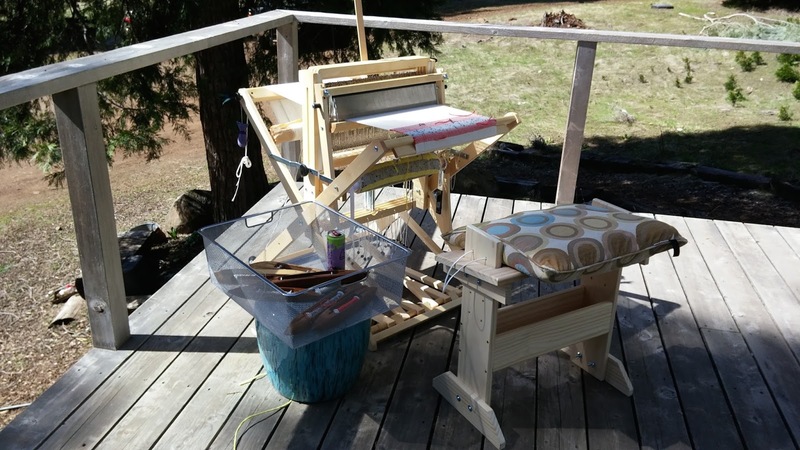 Love the picture of the Wolf Pup LT on your deck - would you please take some pictures of the treadles and lams? 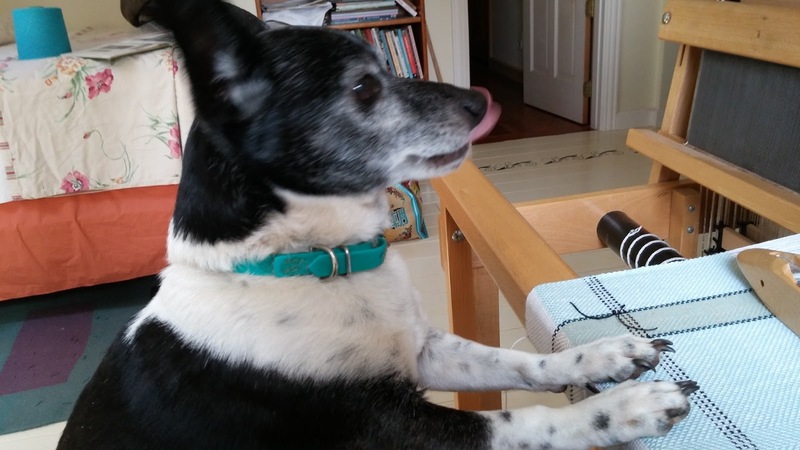 Curious to see how they are attached to the loom. 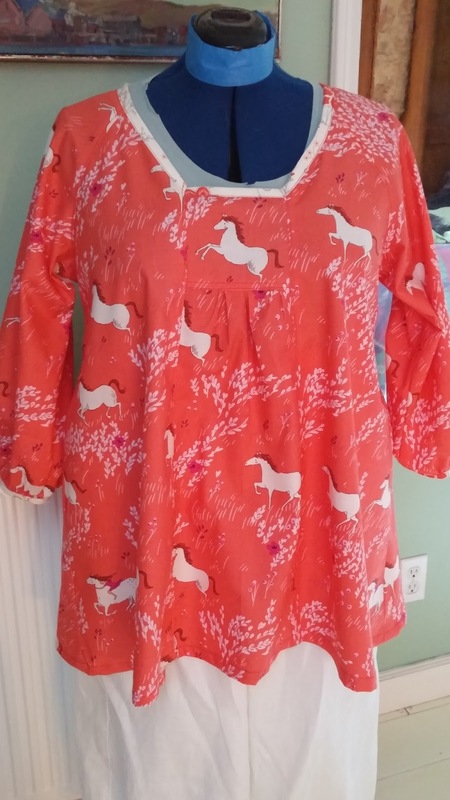 Love the new horse print top, how cute! Such fun. Are those TG linen items I see in the sun? I love love the mustang Sally coral print top. And I think the boho pattern is calling my name... Cute excavator. I have been fortunate to avoid all but one encounter with skunks, and it was a non-stinker. And the roaming skunks leave all those little holes they dig in the yard. Just stopping by to comment that I still read and love your posts Theresa. And I am sure that in the 60s and 70s we would've been sort of like twins. I need to get that pattern! LOTL- SO good to hear from you! Thank you for stopping by and hopefully everything on your end is nothing but good busy. Bill, The dogs thankfully have a secure and very large pen. No skins in, no dogs loose. Priceless! Michelle, I startled one a number of years ago in my tack room, stuck to high heaven for a while. Coco, A couple are, but really it is a mixed bag. A fair amount of Scout Tee with numerous changes. Cindie, I saw the toweling and knew just what I wanted to do with it. 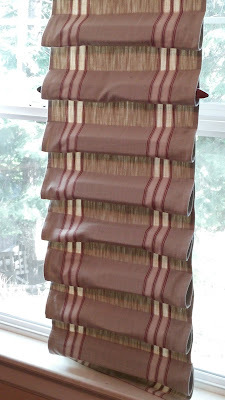 It was kind of a pain in the neck to make though and you know how I feel about home dec type projects...curtains anyone? Valerie- Yep, out little black and white harbingers of spring. Mine shoo away pretty easily without going to stinky extremes. I just love watching a terrier go to ground! They truly have "tunnel vision" while they work!!! 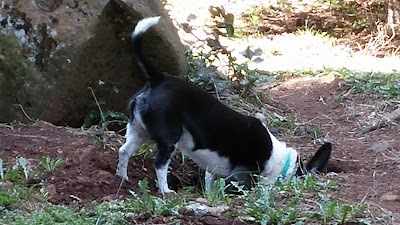 The skunks have been out around here, too...phew! 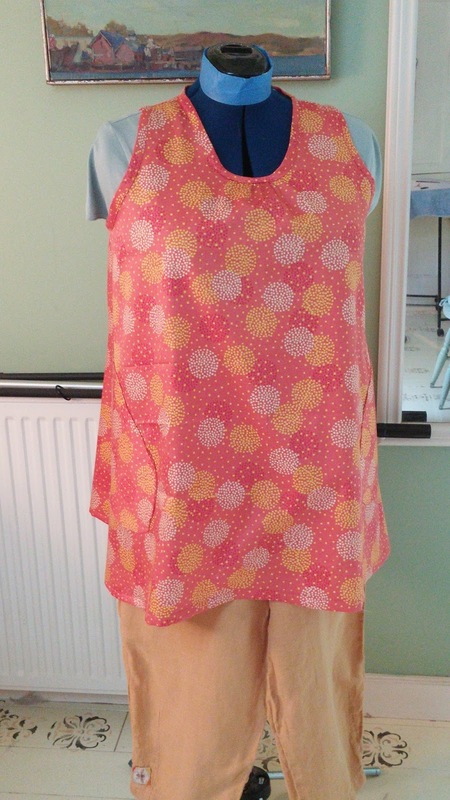 Love all the lovely tops...a reminder to get busy here! Oh you don't want the subject in that last image to encounter one of your first signs of spring. I never knew just how intense that smell was until my neighbour's dog got sprayed. Pwew! Looking forward to getting a clothesline in the yard....I rarely used my dryer in the old house, and need to do some work in the new one to have a place to hang the line. 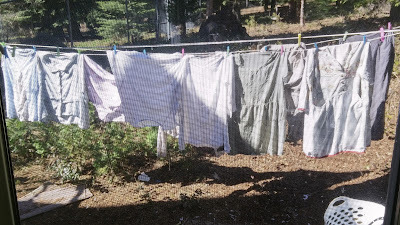 Since it's ALWAYS breezy here, my clothes will dry in a heartbeat; the old house had very little breeze so it took a long time to dry things. I'm new to skunks or I guess I should say they're new to me. I can think of better ways to ring in spring :(. And boy have you given me a bad case of Pup envy. If my Dorset weren't direct tie-up, I'd have it on the deck too. You've made me think that maybe I need a Pup in my life.